I’m adding Fisherman’s Grill to the short list of places I’ve reviewed so far that don’t have table service. 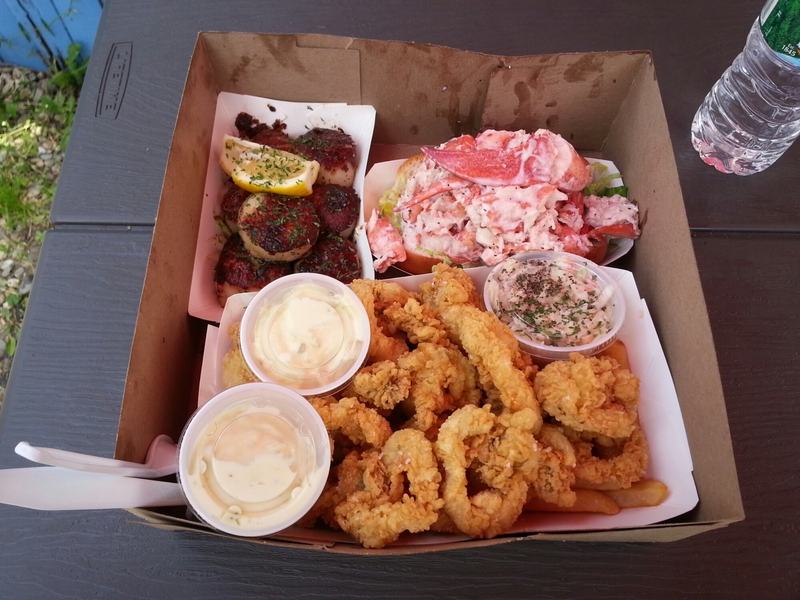 I had a full meal there and figured my readers might enjoy hearing about it, especially since it’s summertime in Maine and they have an outdoor seating area where you can enjoy the great weather and eat the seafood of your choice. If you’re not familiar with it, it might be because it’s a bit hidden on Forest Ave., but you drunkards will know approximately where it is because it’s right by RSVP Discount Beverage. We ended up at Fisherman’s Grill at the urging of my wife who insisted we try it on a gorgeous Saturday afternoon. When we got there I noticed that the sign on the telephone pole out front said “Fisherman’s Net”, but the sign on the building had the correct name. I looked at my wife and questioned, “THIS is Fisherman’s Grill?” She responded with a “Yup” and suggested that it was perfect. It was perfect in all it’s dilapidated shacky glory and we were ready to experience something that was truly Maine in the form of a restaurant we’d never been to. With four outdoor picnic tables and a shoddy exterior which reminded me of every seafood shack in the state, my spidey senses were tingling. We walked in and it was more of the same. There were about three tables, a drink cooler, and a small counter at which to order. A single soul stood behind the counter taking endless orders and two cooks appeared in a window behind her cooking like their jobs depended on it – I’m assuming their jobs actually did depend on it. Once we briefly looked around, we grabbed some laminated menus and started browsing the unusually large number of available items. The menu was truly extensive with lobster, seafood combos and dinners, sandwiches, rolls, grill items, chowder, salads, sides, and kids items. It was a little overwhelming but I liked the choices. I noticed that many of the items were listed as “Market Price”. It turns out that most of the missing prices were on the counter for viewing which was okay by me. My original intention when I went was to get a lobster roll, but with so many choices available, my brain was swirling about and unable to settle enough to make a decision. There was Lobster Mac and Cheese, Lobster Reuben, Clam Cakes, Crab Melts, fried seafood, seared seafood, and lots more. There was even a specials board with a few additional items and combos. I spied the Jumbo Lobster Roll and Pint of Seared Scallops for a hefty $46.95. It was really expensive, but it was hard to ignore because it was just that type of day. I ordered that special and my wife went with the Fried Clam Dinnah which came with fries and coleslaw. After ordering, we went outside to grab a spot at one of the picnic tables. It was hot and we knew the wait would be long based on the number of orders we saw in front of ours. During our wait, we talked until we ran out of words, stared at each other until our eyelids became tired, and had a three round bare-knuckle boxing match. After the final bell rung, we were thirsty, so I was directed by my wife – the winner of our fisticuffs – to obtain some thirst quenching liquids. I went in and grabbed a couple waters from the cooler and waited in line to purchase them. As I got to the front of the line, I was presented with our food. I was ready to consume. I took our waters and box of food out to my wife. We grabbed some paper towels which were already on the table and I slid my wife’s food over to her. Everything looked great and I took a bite of one of the scallops. They were outstanding – beautifully seared with great seasoning. They tasted incredibly fresh. They didn’t need it, but I even dipped a couple in my wife’s tartar sauce which was a perfect example of the traditional seafood dip. I ate all my scallops and absolutely loved them. Next up was my jumbo lobster roll. The jumbo roll was made with a larger-than-life 9.5 ounces of the red crustacean flesh and put into a grilled hot dog bun. I tasted it. Hmmm…it wasn’t what I expected. The lobster meat was cold, but that’s the way most lobster rolls are made in these parts. The issue was that it was really cold – quite a bit colder than if it was refrigerated. Additionally, the roll was excessively watery. Lobsters are very watery since they live and are cooked in water, but after it’s picked, the meat should have been drier and most of the water left behind. It was pretty excessive as a watery mayo was dripping everywhere and making my roll soggy. The last issue with the lobster roll was that it just wasn’t particularly flavorful or sweet. While the menu states that the lobster is picked fresh daily, I had to wonder if what I was eating had been frozen previously. Despite my reservations about the roll, I ate it. After I was done, my wife offered me some of her food. She loved it, so I was excited to try. Her food had sea salt on it instead of table salt which was nice. I tried a fry. It was fine but I’m very particular about my fries, so I moved onto a clam. The clams were pretty large with a coating that reminded me of a cross between a standard batter and crumbs. I juggled one right into my clam-hole. Like the scallops, it was great – probably one of the best fried clams I ever had. They were crunchy outside with delicious, salty batter and super-fresh tasting clams. I tried the coleslaw. It was a typical coleslaw offering, but done without flaws. It was excellent. I finished my wife’s meal and after spending close to 80 bucks on lunch, we were pretty full. I was happy. The lobster roll wasn’t what I was looking for, but fortunately, that was the outlier of the meal. I really wonder what the issue was as their other food was so good. I loved the diveyness of the place and almost everything about the place was really enjoyable. I would definitely go back, but unless I found out there were some changes to it, I’d avoid the lobster and probably choose something fried. This entry was posted in Portland, ME food on July 2, 2014 by peterpeterportlandeater.